Though the arguments advanced in the paper appear logical and persuasive, they remain anchored in the Cold War logic. The two-party logic cannot be applied to understand the complex dynamic that underpins the relationship between the Sino-Pak alliance and India. Such a caricature of the more complex dynamic tends to misrepresent the realities of the relationship between these countries. It is fairly obvious to anyone familiar with the terrain of nuclear weapons, delivery vehicles and the weaponisation of space that it is the dynamics of competition between the US and China that acts as the trigger for many of the current happenings in Asia including South Asia. The US as the dominant power in the world is determined to preserve its preeminent status for as long as possible. It will do so irrespective of the reactions that such actions would evoke across the world. China in the pursuit of its own national interest will also act in ways to counteract and moderate the US power, especially with regard to fighting a conventional war over Taiwan. Pakistan – in conjunction with its all-weather friend China – is using the threat of escalation of all problems with India to a nuclear war. By doing so, it is trying simultaneously to nullify India’s superior strength and weaken her internally by using state sponsored terrorism as a weapon of war by other means. Nuclear weapons including battlefield nuclear weapons are a part of its strategy to prevent any type of Indian military intervention to any act of overt and covert aggression that Pakistan may impose on India. India, which has fought a border war with China and numerous wars/conflict with China’s ally and partner Pakistan, has had to respond in suitable ways to ensure that her own national interests are protected. The paper, by shifting the onus of responsibility for all these happenings on to Indian shoulders chooses very conveniently to ignore these fundamental drivers for the current state of affairs. In one paragraph towards the end of a largely India-oriented discourse on the perils of an uninformed nuclear weapons strategy, the author does refer to some of the developments in China and Pakistan. However he does not elaborate as to how those developments, which have often preceded Indian responses, should affect India’s strategies. This selective myopia converts a larger problem of war and conflict between the countries involved in, – which nuclear weapons may have a role to play – to one of India’s approach to nuclear war and nuclear deterrence as seen through a Cold War lens. As we shall see the current happenings in the Asian region suggest that this is not so. It may be worthwhile to review some of China’s actions that are largely aimed at the US but have an inevitable impact on India’s actions and strategy. 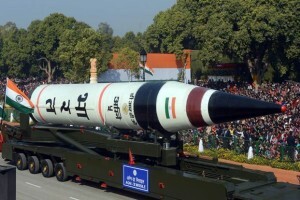 The threat is very real for India given that China deploys nuclear capable missiles like the DF-3, DF-4/4A and the DF-21 across its bases in Qinghai and Yunnan province. These missiles have the capability to reach all parts of India. China’s ballistic missile forces by moving from liquid fuelled missiles to solid fuelled missiles with increased mobility have reduced vulnerabilities and improved response times. The development of the new Type-094 Jin-class nuclear powered submarines and the JL-2 SLBM will further enhance China’s second strike capabilities and promote nuclear deterrence with the US and other nuclear weapon states. The canisterisation of all its solid fuelled missiles including the DF-21, the DF-31 and the DF-31 variants with their improved mobility is also a part of their strategy to deter both nuclear and conventional war. Through the development of the DF-41 ICBM, which has MIRV capability, China is attempting to redress some of the current military imbalances it has with the US. Along with these developments, China is also strengthening its conventional forces as a part of its Anti-Access / Area Denial Strategy. A key component of this strategy is the development and operationalisation of its Anti-ship Ballistic Missile system that will deter active US intervention in a conflict over Taiwan. Chinese space assets, its strong missile design capabilities along with ground based sensing and command and control capabilities, have been put together in a new architecture that will significantly raise the risks for US involvement in a Taiwan conflict. Chinese space capabilities also form a crucial component of such a strategy. In order to put out a ‘strong’ signal, China has since 2005 conducted at least six known or suspected Anti-Satellite (ASAT) tests. In May 2013, China launched a high-altitude rocket which reached an altitude of approximately 10,000 kms before releasing a canister of barium powder. In October 2013, it conducted a manoeuvre wherein a satellite fitted with a mechanical arm captured another satellite in space. All these developments are well advanced. Many of them are already operational whilst the others will very soon reach operational status. A characteristic of the Chinese missile arsenal (including both short range and longer range missiles) is that all of them can carry both nuclear and conventional weapons. Through the creation of ambiguity in the nuclear or non-nuclear use of such weapons, China is attempting to raise the US threshold for fighting a conventional war and thus hopes to deter the US from intervening in a Taiwan conflict. Though China has so far not shown any intention of using such a strategy in its border problem with India, New Delhi needs to take suitable steps to signal both capabilities and possible future actions to her powerful neighbour. Both canisterisation and MIRVing are to be seen as a part of the strong signals that India is sending to China in the context of China’s current strategy, that links the threat of nuclear war as a response to any conventional military intervention. Viewed from this perspective, it is difficult for any objective analyst to see these developments as destabilising. As a part of its grand global strategy, China has actively supported and will continue to support Pakistan in its efforts to destabilise and weaken India. Chinese help for Pakistan’s nuclear programme is well documented. Not only have designs been transferred but China has also helped Pakistan test a weapon in Lop Nor well before the Chagai tests of 1998. There is also no doubt that the Ghaznavi and the Shaheen-1 missiles are Chinese in origin. China’s supply of nuclear power plants at Chasma and Karachi is indicative of the continued linkages between the two powers in the nuclear sector. Internationally, one cannot preclude Chinese support to Pakistan in the FMCT negotiations in Geneva. Thus, New Delhi wouldn’t be too wrong in anticipating that technologies for carrying multiple warheads and launching missiles from submarines will make their way from China to Pakistan. As far as Pakistan is concerned, its nuclear weapons and strategies are entirely India-centric. In spite of three wars and a major setback in the Kargil conflict, it has so far not changed its fundamental approach. The use of non-state actors to further its cause does not require any reiteration. In the nuclear weapon and missile domains, it is trying to change the terms of its engagement with India from a strategic nuclear weapons game into a more conventional war-deterrence game. Pakistan’s recent focus on the Khushab reactors and the production of plutonium, cruise missiles and the Nasr battlefield nuclear capable missile that can be used in a land war with India, are clear indications of a shift away from a simple nuclear deterrence strategy towards a more complex conflict or war deterring strategy that uses the threat of nuclear escalation to deter the opponent – in this case India. An additional benefit of such a strategy is that it can help Pakistan in continuing its support to jehadi terrorist groups without any response from India. The above developments would suggest that both China and Pakistan follow similar approaches. For them nuclear weapons are not meant to deter and prevent nuclear war but to raise the threshold for any kind of military intervention in a conflict scenario with their adversaries. If this be the case, then to categorise the Indian response signals to her adversaries’ actions as destabilising is to apply the Cold War logic of deterring nuclear war to a more complex situation in the Asian region. As of now, China has chosen not to replicate the situation in the Taiwan Straits on the Indian border. There is no guarantee however that this will not happen in the future. India therefore needs to preserve technological and strategic options should such a situation arise. Both canisterisation and the MIRVing of its missiles need to be seen in this context. They act as options for the future rather than intentions for immediate deployment. The situation with respect to Pakistan though similar is somewhat different. Islamabad is looking at rapid deployment of smaller, lower-yield weapons configured for battlefield use. As stated earlier, these make the link between conventional conflict and use of nuclear weapons obvious. So far India has chosen not to respond, maybe because it feels the situation is yet to reach such a point. Nuclear doctrine and strategies are dynamic in nature and are not set in stone. They evolve and change in response to changing security environment that any country faces. Depending on the security challenges that India faces, New Delhi’s strategies and postures will evolve. Current developments however do not warrant a change in India’s nuclear doctrine of No First Use and Credible Minimum Deterrence. One of the main problems with Dr. Kristensen’s article is the simplified lens that it employs to view the complex dynamic that underpins the relationship between the China-Pakistan alliance and India. Also, it does not take into account the larger US-China competition which is the overall driver triggering many of these developments. Such an understanding also fails to take into account India’s unique geo-political situation where it shares borders and a troubled history with two nuclear armed neighbours in China and Pakistan. While China has the distinction of possessing the world’s fastest growing nuclear force, Pakistan is home to the fastest growing nuclear stockpile in the globe today. In the background of continued Sino-Pak alliance, these developments pose an important security challenge for India. Given his expertise and some of the statements made in the paper, it is difficult to believe that the author does not appreciate the complexity and totality of this problem. By choosing to selectively focus on different players at different times, the attempt seems to be looking at the symptoms rather than the cause of the problems. Instead of viewing the issue as a China-India or an India-Pakistan problem, it would be far more useful to view the dynamic as a US-China-India-Pakistan continuum, where until the stability of dynamics between US and China is addressed, one would expect such developments to continue. Towards the end of the article, the author espouses several laudable objectives like halting deployment of multiple warheads which India, China and Pakistan could work towards. The problem is that the horses have already bolted the stable with China’s development of the DF-41 with MIRV capability. Thus, given the existing situation it is unlikely that such initiatives would achieve fruition. This response does not address the issue that India’s missile posture is Pakistan-Centric and does not appear to take China adequately into the reckoning. There is also the serious criticism elsewhere that India talks too much and does too little sparking arms races that it lacks the competence to enter. Should DRDO engineers like Saraswat and Chander be making statements which are really in the realm of government policy-makers ?